If you read my reviews often enough, you already know that I am a huge fan of traditional country music. I am a total and complete sucker for two-steppin', sawdusty, boot-scootin', stone-cold true country music and this album is packed with it. From first stanza to last I was utterly, totally and completely focused on this album, the lyrics and the music. This is definitely one of those "push the keyboard away, lean back in your chair, put your feet up, and just listen" albums and I just know, that somewhere in honky tonk heaven, Keith Whitley was smiling because the style, and the meter, of Pride's phrasing is reminiscent of Whitley's. That's not to imply that he sounds like him; Pride doesn't sound like anybody else. His voice is unique and he definitely seems comfortable just about anywhere between baritone and tenor. There are far too many really good songs on the album for me to name only one or two that stood out but "Master of Illusion" just blew me away. Pride certainly has a knack for picking songs with meaningful, and memorable, hooks. This album gives you an even dozen of fantastic lyrics; masterfully delivered vocally, and reinforced by some dynamite instrumental riffs. The songs are diverse in theme but, by the same token, they are absolutely perfect silage for true country music junkies who crave honest lyrics that are relevant to real life. "No Need Knocking" reinforces the positive lyrics with some delightful instrumentals and vocal harmonies but just as you are feeling deliriously happy about everything, "She's Not You" flows out from the speakers, washes over your psyche and wraps around your heart. It doesn't necessarily bring you down but it is guaranteed to encourage a nostalgia trip to a lost love. For those of us old enough to remember, "The Truth is I Lied," will transport you back to the late fifties and dredge up old memories of sock-hops in the school gymnasium; while the saxophone on this cut is absolute perfection and encourages a "stroll" down memory lane. The final cut, "Good Thing," has an uplifting gospel feel to it. I didn't want it to end. Seriously, I just wanted to keep swayin' to the music, eyes closed, hands in the air ... man oh man I needed that break! Great stuff. 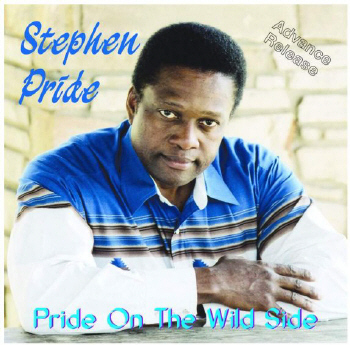 After listening to this album, several times, I wasn't able to figure out why it is titled Pride on the Wild Side. Although my lack of understanding about the title had absolutely no bearing at all on how I felt about this album - I love it - my curiosity was killing me so I sent off a note to Stephen Pride. As it turns out, the title of this album is a prelude to the next album and I'm certainly not going to spoil the surprise by telling you what it is. However, I can tell you that it will be the perfect encore for the twelve songs on this CD. On his website it says "The vocal stylings of Stephen Pride will carry you back to places you'll remember, and whisk you away to places you will long to be." I categorically agree; completely. Do yourself a favor and pick up a copy of this album.